Starting tomorrow, I'll be working 2 days a week at Little River Outfitters fly shop in Townsend for a few months. My normal work days will be Thursday and Friday (until 5:00 p.m.). Stop by and say hello if you are in the area! The rest of the time, I'll still be guiding. 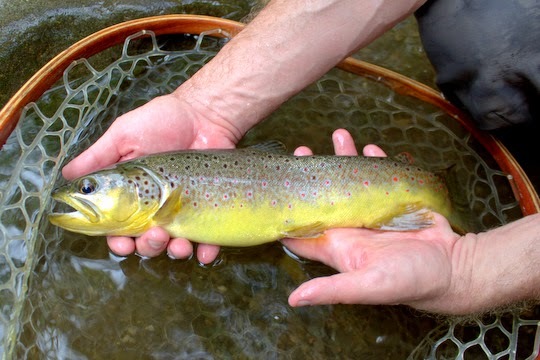 The mountains are fishing great right now with the cooler weather. If you are looking to take a guided fly fishing trip this summer the next week or so might be the perfect time to get out. Water levels are ideal as well as the temperatures. 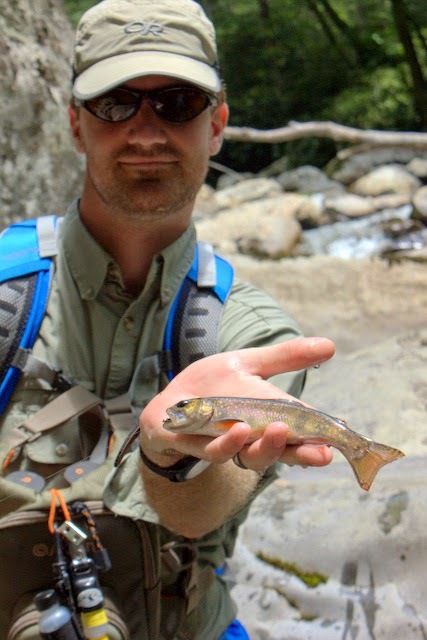 I'm offering a couple of new short guide trip options for wading in the mountains. Some people would rather fish with a guide so they can watch and learn. 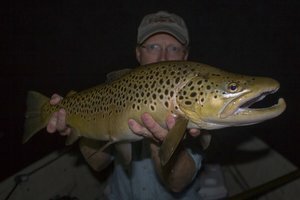 Join me for a "Fish with a Guide" trip or check out the new "Evening Hatch" special. 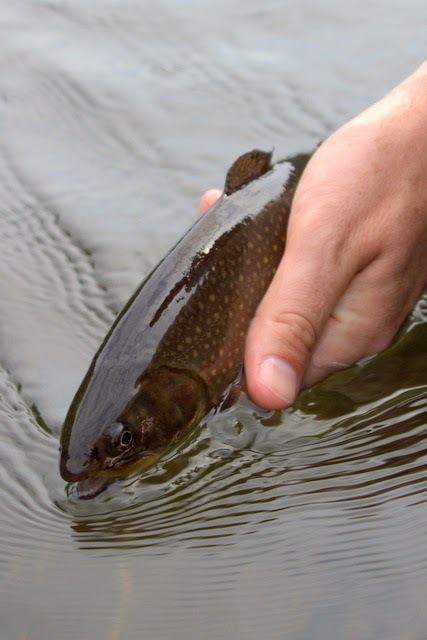 Head over to Trout Zone Anglers and look at the Services page for more information. Both of these new options are on a very limited basis so if you are interested in booking one, do so quickly before the available evenings are filled. When my cousin Nathan came up for several days of fly fishing, I knew we would have a great time. The first day of smallmouth fishing was fun and the Caney Fork float produced that nice brown I'm always looking for. 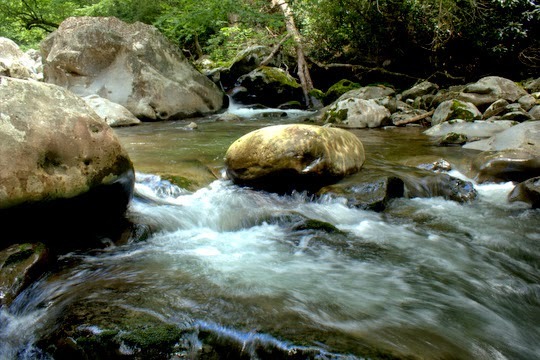 Next up on our list was the Great Smoky Mountains National Park and hopefully a mid to high elevation stream that had good numbers of rainbow and brook trout. Arriving in the afternoon at our campsite, we hurried to set up the tent and stash our sleeping pads and sleeping bags before hitting the water. Not wanting to fish too long, we stayed close to camp, walking no more than a mile before we started fishing. We each caught a few fish, and I took some pictures before heading out to go try out a new restaurant in Townsend for supper, the Monte Real Mexican Restaurant. Turns out the food was good! We enjoyed it knowing that the menu was camp food for the next day and a half. After a good night's sleep, we were up and ready to fish hard all day. Our goal was to return to a gorge we had fished together a few years ago. Sure enough, it was just as amazing as we remembered. This particular stretch of water has both rainbows and brookies and is among the most rugged stretches of water in the Park. Numerous times we reached places where continuing on meant boosting each other to climb over the huge boulders. Not for the faint of heart nor for the weak, this stretch of water should never be tackled solo for obvious safety reasons, but the fishing is so worth it. 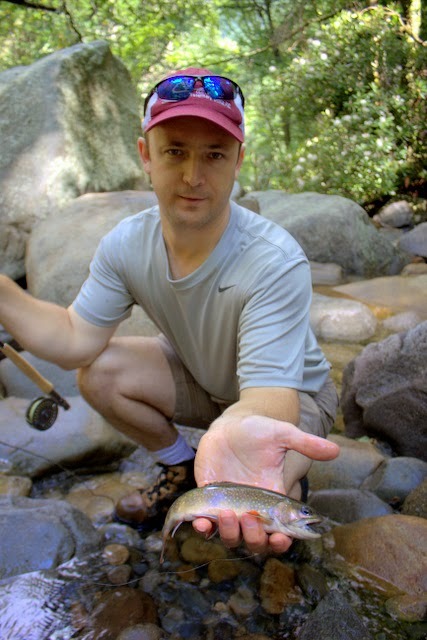 The rainbows here are thick and never vanish completely, but the higher you go the more brook trout you can find. I caught a nice one early on, and on a dry fly at that! 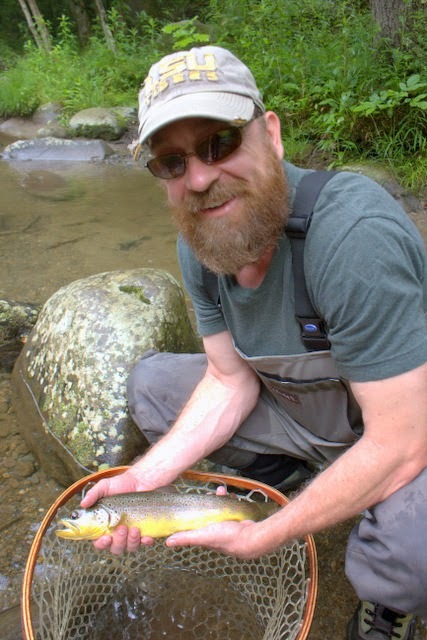 In between the brookies, the rainbows kept us more than busy. While none were large, they were plentiful and eager to hit our flies. 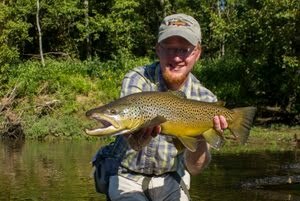 Enough fish kept hitting the dry to keep us from going to straight nymphs but most were hitting the dropper. 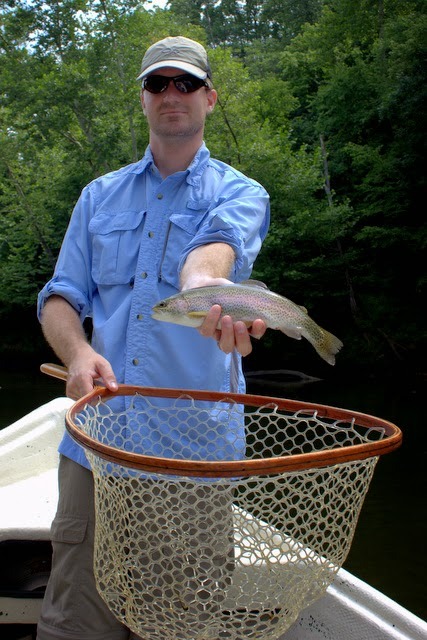 In the low clear water we could often watch the fish materialize off of the bottom to come up and swirl on the little bead head trailing behind the dry fly. The stream is beautiful which is part of the reason I keep coming back. The fish are the other part of course. Between those two things, the visiting angler most be extremely careful. To spend too much time on one section means getting stranded in this long gorge overnight, not a fun idea. Since there were two of us, I spent quite a bit of time with my camera. This is something that is harder to do when you are the only one fishing. I tend to get so focused on my fishing that I forgot to enjoy the sights around me, but when I'm sitting back to watch a friend fish, getting out the camera just makes sense. In this case, it allowed me to get two back to back shots that I think turned out well. The fish just kept coming to hand and the farther we went the better the fishing got. Not too far from where we would climb out and hit the trail back, I had a very nice fish hit and somehow managed to keep it on the line. 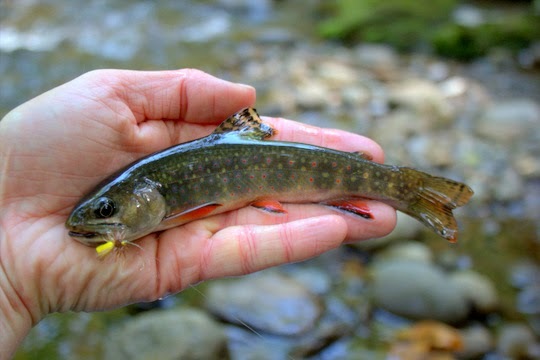 My best fish of the day turned out to be a brookie, and I couldn't have been happier! The hike out was all down hill so we made good time and were soon back at camp for a relaxing evening around the fire. This trip will be one that I remember for a long time. It's always great to get out with my cousin Nathan! "Can you handle a really rough stream? Like climbing over boulders and scrambling over logs?" When the potential client answered in the affirmative, I decided to take a chance. As a guide, safety always comes first. Oh, sure, when I'm out fishing on my own I've been known to occasionally cut corners in the safety department. I've taken some really hard falls also. Getting into those tough to access streams is sometimes worth it although not always. For this particular guide trip I decided to try a stream that is tough to access but not terribly difficult to navigate once you are in the stream bed. Just hope it doesn't storm upstream. Getting out includes a bushwhack and mountain climbing if you try in the wrong spot, maybe even if you try in the right spot. The other detail for this particular trip is that my client would be a first time fly fisherman. As with all guide trips, I never know for sure what to expect but with beginners that big question mark looms a little larger. Some people take to the sport like a fish takes to water and others are more like Frog's Fanny meeting up with water. Of course, the majority end up being somewhere between these two extremes. 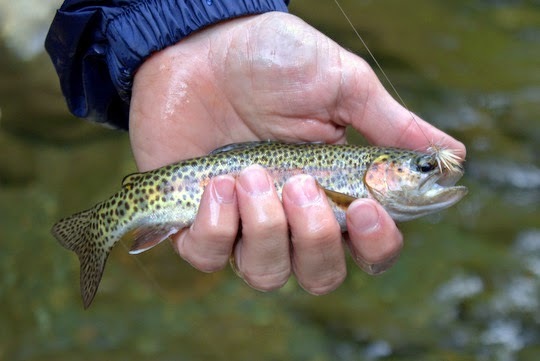 Only the rarest of individuals can pick up a fly rod and start casting the rod with one hand, tending the line with the other, throwing mends in the line when necessary, setting the hook as quickly as required, and in general doing all of the little things that add up to fish caught. When we arrived stream side, accessing the water was our first challenge. After a long walk we got to the spot where we would jump in and start fishing upstream. 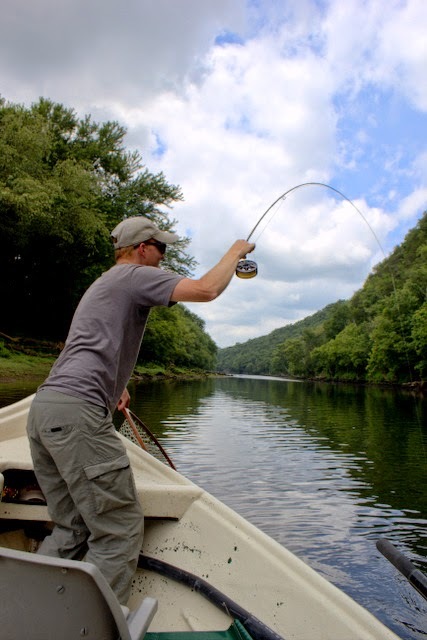 I gave a quick explanation of the mechanics of fly casting, and gave Stephen the fly rod. Within about ten casts, with only a couple of suggestions, he was casting. I showed him about holding the line with his other hand and he immediately started casting like he had done it his whole life. Moving up the stream he started catching fish here and there, sometimes several per pool. The first fish of the day was a gorgeous brook trout. Later, another pool was good for a Smoky Mountain double. Seriously, I've fished the Park a lot and had this happen only a couple of times. This guy was on fire. Eventually the day was over, but not before Stephen impressed me with how quickly he took to the sport. There are very few beginners out there who can legitimately say they caught 25 or 30 trout on their first day of fly fishing. The scenery was great as well. The Rhododendron is past its peak at low elevations but good in the mid to high elevations right now. It was a pleasure having Stephen out on the water for a day of fly fishing. I wish him the best as he continues in this new hobby. 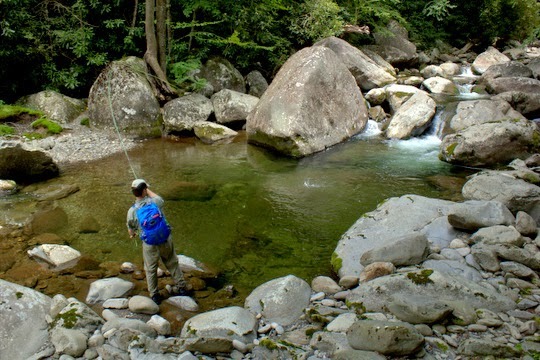 If you are interested in a guided fly fishing trip in the Smokies, please contact me at TroutZoneAnglers@gmail.com or call/text (931) 261-1884 or see TroutZoneAnglers.com for more information. 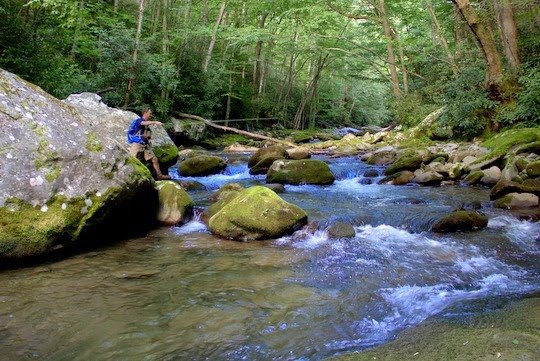 This summer, I have been blessed to share the Smokies with many anglers from all over the country. That's one cool thing about being a guide: you get to meet a lot of interesting people. Some of the best trips are where I get to take young people fishing. I recently had the chance to guide a father/son duo who live just down the road from me. They were wanting to learn some skills that will consistently get them into fish in the Smokies. Originally planned as an overnight backcountry trip, the threat of rain encouraged us to rethink the trip. Ultimately Kent decided that he and his son Blake would enjoy things more if they stayed somewhere with real beds and some A.C. instead of dodging the rain and thundershowers up in the mountains. On our first day of fishing, things went well as we covered Smoky Mountain fishing techniques and caught some fish along the way. The second day was great however. On the spur of the moment, I decided to take them to a high gradient stream where I have always had great success. Having seen them work around a stream the day before, I knew that they could handle the hard work required to maneuver through a stream like this. 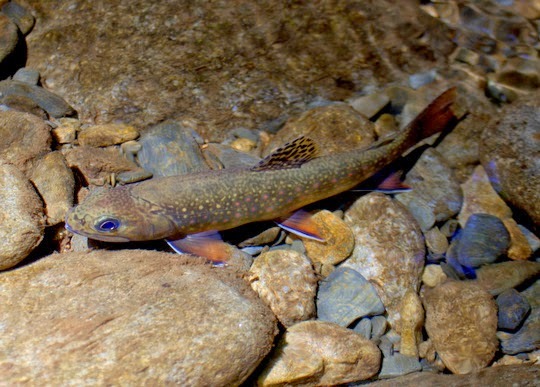 Also, Blake wanted to catch a native brook trout and the stream I chose offered us a chance at brookies. After picking them up at Little River Outfitters, we headed up the mountain. Let's just say we took care of the brook trout pretty quickly! In one of the first little pools, I showed Blake how to sneak up on the pool by using a rock to hide behind. On his first cast, a brookie came out and slammed the fly. Mission accomplished! Continuing up the stream, we eventually transitioned to fishing subsurface patterns. That has been a theme this summer. 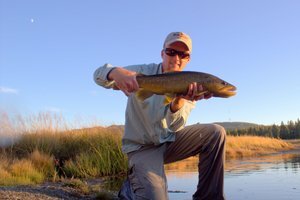 You can catch fish on dries, and even catch some really nice ones, but overall the dry fly fishing this year has been less than stellar. If you must fish the dry, then try dropping a bead head nymph 18-24 inches behind the dry. 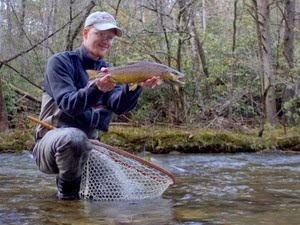 Near the end of our trip, I mentioned to Kent that if he really wanted to master fishing in the Smokies, he would need to learn to nymph without an indicator in the old "high stick" style. 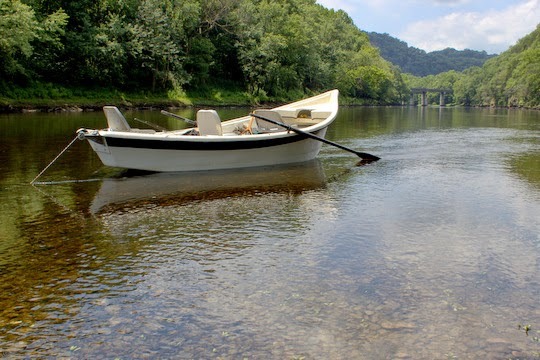 Quite similar to Czech nymphing, high stickin' developed separately here in the Southern Appalachians and originally was executed with a long cane pole. The old timers could effectively cover even large pools with this method. The beauty of fishing without an indicator is that you can vary the depth of each drift depending on the depth of the water you are fishing. Of course, it does have limitations, most obvious of which is that it works very effectively at close range, but once you have to make longer casts it begins to become more difficult to manage all that fly line. Anyway, as soon as I mentioned it to Kent, he was all ready to try it out. 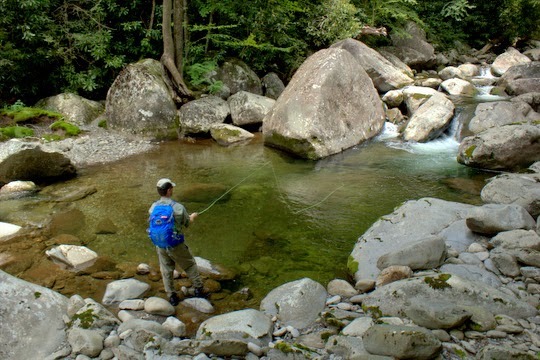 Even though I normally reserve teaching this technique to anglers who have a little more experience in fishing the Smokies, I could tell that Kent had all of the skills necessary to make it work. In the very first pool he tried, Kent had several strikes before catching a fish. Once he got the hang of it, he was ready to start putting up some serious numbers. At the end of the trip, we decided to do one last picture with Blake's last trout. These father/son trips are going to provide great memories for many years to come! It was a pleasure spending a day and a half with these two guys. 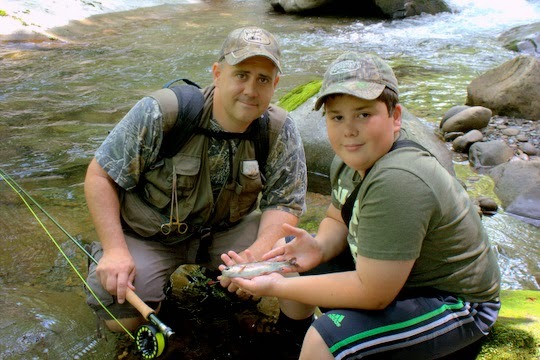 They were very quick learners and are well on their way to becoming great Smoky Mountain anglers. Thanks for a good trip guys! 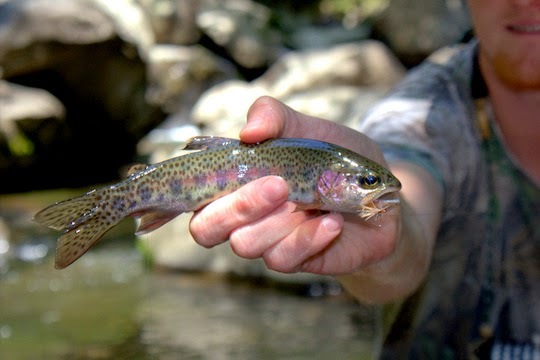 If you are interested in a guided fly fishing trip in the Smoky Mountains, please email me at TroutZoneAnglers@Gmail.com or text/call (931) 261-1884. 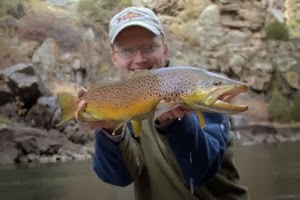 You can also visit my guide site at TroutZoneAnglers.com. Happy 4th of July to everyone out there! I'm thankful to live in a great country where we can celebrate freedom. Stay safe out there with the fireworks! One of the toughest parts of guiding is probably similar to raising a kid, but I can only speak from experience on one of those. I'm talking about watching someone else doing something and you just wish you could step in and help them do everything correctly. If you're a parent, maybe you can let me know if that's about how it goes or not. As I guide, I definitely know the feeling. Yesterday I had the pleasure of guiding Shane for a day in the Smokies. 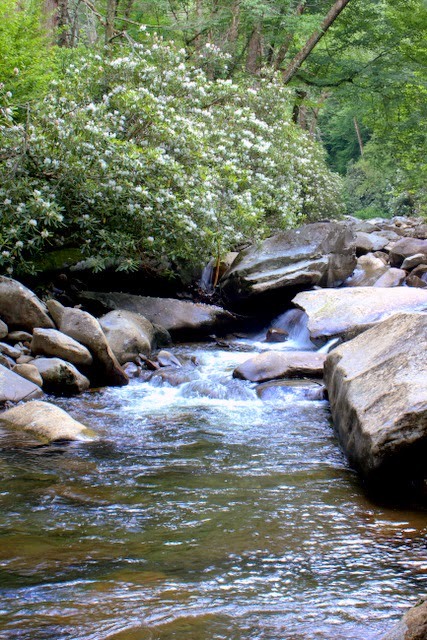 Having lived in Tennessee for a few years, but never making it over to fish the Smokies, it was high time he learned a little about the Park streams and how to catch the beautiful wild trout there. With a cool start to the morning, I decided that fishing on Little River would be a good way to start the day and we stopped in a likely area. After chatting a bit while rigging up and getting on our wading gear, we finally approached the stream. Looking just downstream, I noticed a spot that I've long suspected had a nice fish. After getting confirmation from Shane that he was willing to start his day with a challenge, I explained the approach, the cast, and the drift. He nodded and started to work into position. After a few drifts in which I felt we weren't getting deep enough, I added another split shot and he resumed casting. A few casts later the indicator dove convincingly. 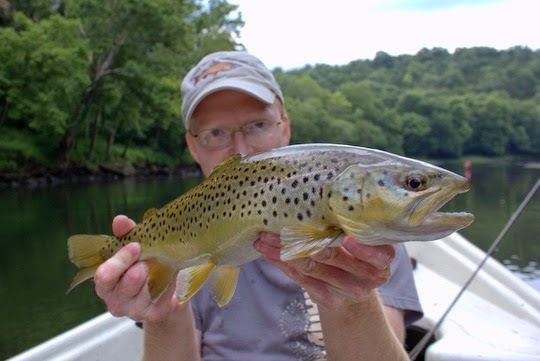 When he set the hook, a beautiful brown trout came all the way out of the water in a leap for its life. Immediately I got nervous. Fish like that don't come around every day, and certainly not in the Smokies. Thankfully, I hadn't told Shane that his bottom fly was on with 6x tippet so he wasn't nearly as nervous as I was. In fact, he was probably one of the calmest anglers I've seen with a nice fish on the other end of the line. While I was nervous and really concerned about losing that fish, Shane did everything he needed to perfectly, working downstream with the fish until he was able to lift its head so I could slide the net under it. I had spent all that time worried, and in the end I didn't need to. 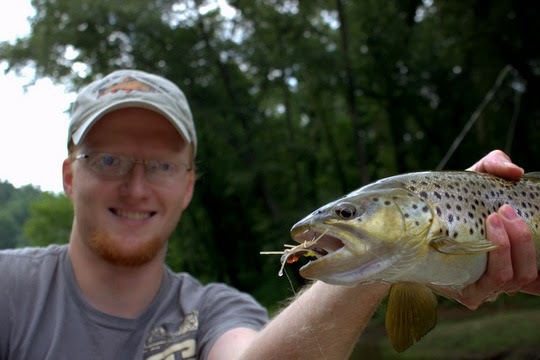 Shane did a great job fighting such a nice brown trout and clearly didn't need any help at all. 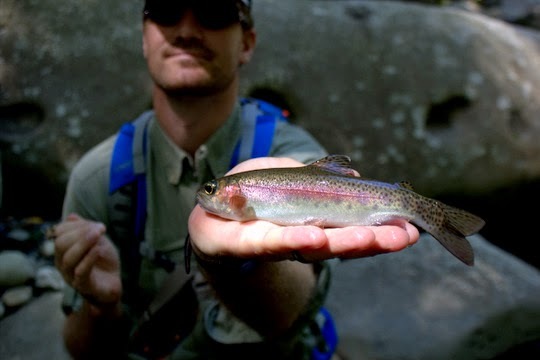 There are few people who can say their first Smoky Mountain trout was such a pretty fish. 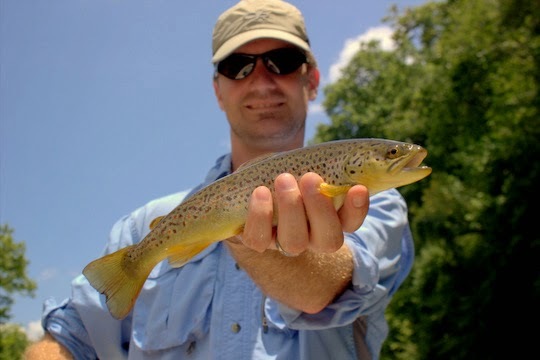 Congrats to Shane on a job well done and a beautiful Smoky Mountain brown trout! 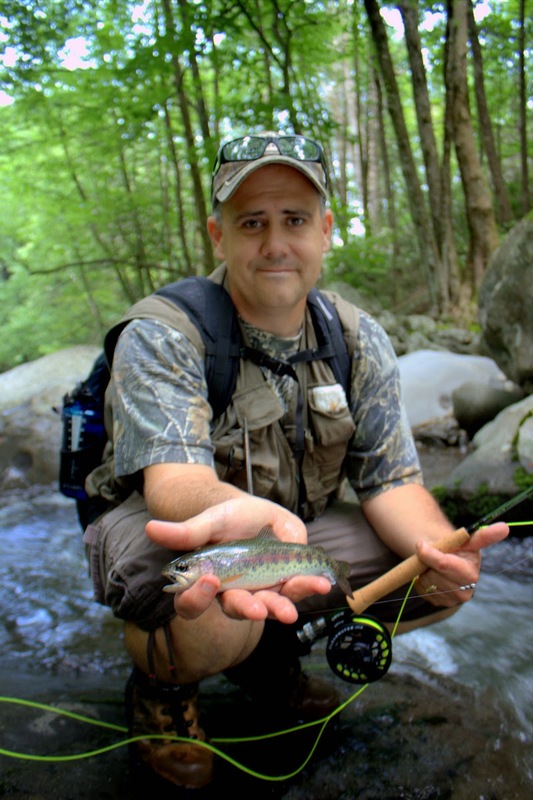 If you are interested in a guided fly fishing trip in the Great Smoky Mountains, please contact me via email at TroutZoneAnglers@gmail.com.